Sick of searching for lost lids? You need Together-Ware! Together-Ware is a simplified new storage system that connects each container and lid by a ring! No more lost lids - no more searching through mismatched pieces - the two pieces will always be together! And at $19.99 - this six piece set is a steal! I was very excited when the wonderful people at Together-Ware offered to send me one of their six piece storage sets to try out! The six piece set comes with a 1.1 cup square, 1.75 cup square, 3 cup square, 4.8 cup rectangle, 7 cup square and 9.5 cup square - so you'll have everything you need to store your leftovers, or whatever else you'd like! :) These containers are also microwave and dishwasher safe (in the top rack) which means they won't warp! The ring also keeps the container in place during the dishwashing cycle - minimizing water collection in/on the container! 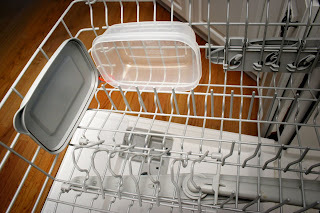 I don't know about you, but that's one of my pet peeves about putting other plastic containers in the dishwasher! I hate having to shake or towel them off! *Read more about Together-Ware on Together-Ware.com or call for questions or ordering information. *Tell me what you hate about your current containers or what you look for in container sets! I would look for containers that are rectangular or square rather than round, dishwasher safe, and long-lasting. I hate that the lids to my storage containers always roll out of the cupboard when I grab one of the bottoms. What a novel idea!! I would love to try these. I hate cleaning up and just grabbing a container then having to search for the lid and sometimes not even finding the lid so you have to switch containers so you have a lid. I like the round containers,they are easier to fit in my fridge.The square containers take up so much unused space. I am a fan on Facebook,Tonya Wxxxxn. I don't like the containers I have right now because the lids are so curled from the dishwasher that they don't fit the bottoms anymore. I subscribe to your blog via e-mail. I hate trying to find tops in my dark, small cabinets! These look like a lifesaver! I twittered about togetherware, mbh88. I entered the EyeBuy Direct Prescription Eyeglasses giveaway. They must be sturdy, and not stain, warp or crack! The lids need to fit after washing too! I follow via Google Friends. I entered your Famous Foorwear giveaway. I entered your Eye Buy Direct giveaway. Anne Marie - a.haun@sbcglobal.net I look for containers that are a little bit larger - some of the smaller ones hold very little! I also hate looking for lids - this sounds like the perfect answer!! I hate that I just dont have a real set. lol I use like butter and sugar tubs. They work, but it's still kinda wierd. Bonus : I subscribe via email! *I have a drawer FULL of mismatched lids and containers - it takes up WAY too much space! I hate that my husband sticks all the storage containers on the top of the pantry where I can't reach them. These would be perfect as we could hang them in a lower location. I hate that the lids never stay on. I hate missing lids more than anything! I hate lids falling down on me from the cupboard, and having 20 different kinds of lids all stacked together. Thanks for this chance! I hate flimsy containers that get destroyed in dishwashers, they sorta get warped and do not fit as well. My main gripe is finding an organized way(that takes up less space) in my cabinets for the containers. Right now they are a mess. What I hate about my currnet containers is never being able to find the proper lids and the stains they get when I put taco meat, or spagetti sauce in them. #1, I am a subscriber to your blog through email. #2, I am a subscriber to your blog through email. I folow you on Blogger. I hate that the lids get tossed around in the dishwasher, have water standing in them, and the water ends up getting tipped over on the dry dishes on the bottom rack. My storage containers are always missing their lids. Maybe you should send yours my way. I have no idea where they all go! I hate the fact I always have more lids than anything else! I also entered the glasses giveaway! 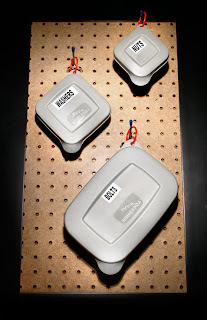 I need containers with attached lids so I dont lose them. Also lids that are solid enough so they dont break easily. I dont like the containers I have now because it is hard to get the lids to close good! This is such a no-brainer idea - I love it! Why didn't they come out with these years ago so I wouldn't have had to endure so much anquish when it comes to finding a container to take my lunch in. Please, please, please enter me - I would love these! I've also been a subscriber to your site for a while now! Love it! Hi, Our current sets are NOT sets! They are a hodge podge of lids and bottoms. My husband uses these for his lunch on a daily basis. He would love this Together-Ware Set. Also, I follow you on Twitter. I am a fan on your Facebook Page! what a great giveaway! i could use these. my current plastic containers always get separated from their lids, which are never to be found again. my cabinets "eat" lids/plastic containers worse than my washing machine "eats" socks! i always struggle to find matches. I look for small, compact storage containers that fit well in my small fridge. I can never find the right lid!! I hate that I have no lids that match any of my containers. I would look for the containers which donot peel after being used 10 times. I would like the containers to be spice-safe meaning the peeling starts if you put your leftovers in them which contains oil, salt and spices. I don't have any complaints about my current containers (rubbermaid easy find lids) other than I just don't have enough. Well I hate when I have containers, but no lids to match because they have melted, cracked or warped. Or vice versa....a million lids and they don't fit any containers. With these everything would stay together so nicely! I just moved and threw all my containers out b/c they were gross and stained..I'd say the state of my current containers is non-existent. I love how the lids are connected! I have 2 containers that I love...one is Ziploc that I use to make snack mix in and the other is Ziploc re-usable. I am a brand new subscriber!! I am now following on twitter and retweeted!! I am now following you through blogger!! I look for snug fitting lids that don't pop-off too easily and don't leak. Keeping up with the tops is always a chore. This is a novel idea! i don't really hate mine , i simply don't have enough! I hate that when I open the cupboard--half the time it rains lids on me---my husband like to keep large yogurt containers--and sour cream containers etc--the different brands do not share the same lids--so it's a nightmare finding a lid that really fits. What I hate about my current containers are that most of them I can't find the lids anymore! I hate when clear plastic containers absorb the color of the food they are storing! I'm entering your shelf reliance giveaway! I hate the fact that I can NEVER find a matching set.... I swear to you someone comes and steals my covers or bottoms every other day!!! I'm a BIG fan on facebook too!!! im a follower! i love the way these stick together! My container stash has dwindled lots of mismatched lids and containers. What a great giveaway! I just love containers as I take my lunch to work everyday. I love having many different sizes to fit whatever need we have. I linked over from frugalsuz's blog - and I love giveaways, even if I never win. Current staff of affairs is a shelf full of mismatched plastic, with a few new Ziploc containers bought with coupons! Mine are always falling out of the cupboard and/or getting lost/mismatched! I hate my current collection of mismatched yogurt, margarine, and cool-whip containers because it takes forever to find the lids! What a neat idea to be able to hang the lids up and save space! I am entering the can saver giveaway as well. I'd like to try these. Lindsay, I subscribe to your blog and its one of my favorites. I entered the consolidator giveaway! I am like you about the water in the dishwasher thing. I like that these have the rings to keep them together. We have been looking for new containers for my husband to take lunches to work, so this would be a great help. I entered on the cansolidator contest. i hate containers that leak, so i look for tight lids. I entered the Shelf Reliance giveaway. I subscribed to you on Facebook and placed an entry for eyeglasses too. I really need tupperware, my current ones get wrecked in the dishwasher! These look like high quality ones. Thanks for doing this! Right now I lids that don't fit and containers that don't stack well. these would be nice. Thanks! I really would like new containers as my old ones (and I mean old...yuck!) are stained. These ones look so nice and I love that the lids are hooked on. Wow no more digging for lids!!! I am a email subscriber!